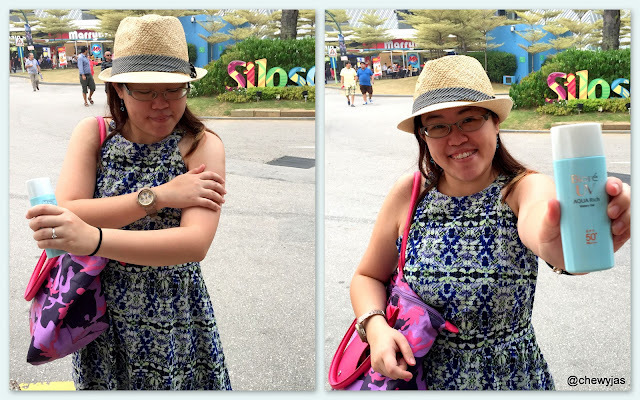 Living in the tropical Singapore, whereby what we experience every day, all year round is either sunny days or rainy days, a good sunscreen is very essential. A beautician once told me that if you can have only one product in your beauty regimen, it must be sunscreen. So I argue back that my job don't even requires me to go outdoor that often, and she told me that even the lights in our office are emitting UV rays and sunscreen can protect our skin from that. I've tried a few sunscreen products but stopped using them as I find that the after effects makes me feels either too oily or sticky when all I wanted was to feel clean and fresh. 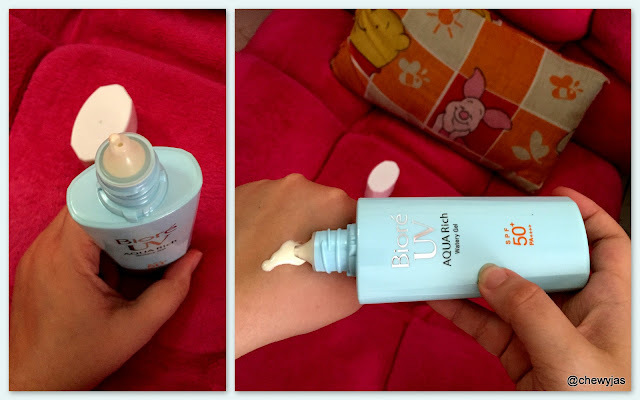 I was glad to have the opportunity to try out the Biore UV Aqua Rich Watery Gel which changed my opinion of sunscreen lotion totally! A 2014 Benchmark Survey commissioned by Kao Singapore revealed that only 30% of the women between the age of 12 to 49 years old use a sunscreen daily and this figures remained unchanged for the past five years. To be honest, I belong to the 70% group before I tried the Biore UV Aqua Rich Watery Gel. Prolonged exposure to the sun's UV rays without proper protection can cause permanent effects like premature skin ageing, wrinkles & freckles, as well as various skin damages like discolouration, dryness and in extreme cases, they can also lead to skin cancer. So start making protection against UV damage a priority. Shield against skin woes that could be easily prevented such as sun spots, wrinkles and freckles caused by damaging Ultraviolet (UV) rays. For a start, Biore has introduced its complete range of new and enhanced sunscreen products, offering the highest level of UV protection recognised in the industry - SPF50+ and PA++++ rating (previously PA+++). The Biore UV Aqua Rich Watery Gel is the newest addition to the range, which provides the highest level of UV protection from head to toe. A little facts about the UV rays. The two most damaging UV rays can be classified into different wavelengths, known as UVA and UVB. UVA rays penetrate into the deeper layers of our skin as compared to UVB rays, and are also the dominant tanning ray. UVA rays is able to penetrate through glass thus our skin continues to be exposed to the harmful effects even though we are sheltered indoors. On the other hand, UVB Rays cause the most damage to the outer layer of skin such as reddening of skin and sunburns. 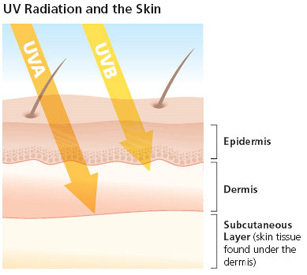 Without proper protection, prolonged exposure to UVB rays can cause long-term damage to our skin's epidermal layers. Now that we understand more about the UV rays, let's find out how the sunscreen products are bring rated. Sunscreen products are rated based on two rating systems, known as the Skin Protection Factor (SPF) and the PA rating system. The SPF rating determines the duration of time your skin stays protected against UVB rays from the sun. There's even a simple calculation method - SPF Rating x (no. of minutes for skin to darken under sun) - No. of minutes skin is protected from UVB rays. A sunscreen with the rating of SPF50 provides sufficient coverage as it blocks up to 98% of UVB rays from penetrating into our skin. Anything higher than a SPF50 rating compromises on the texture of the sunscreen, making it heavier and greasier when applied to skin. On the other hand, the PA rating is a Japanese rating system that shows how much protection you are receiving against UVA rays. Currently, the highest standard of PA protection in the industry is PA++++. Thus, the Biore UV Aqua Rich Watery Gel has actually met the highest PA rating as well as sufficient coverage in terms of SPF rating. The Biore UV Aqua Rich Watery Gel is formulated with Biore's unique Aqua Rich technology which is similar to the Aqua Rich Watery Essence. When applied, my skin feels smooth without the sticky feeling at all! It's just amazing. Not only that, the Aqua Rich Watery Gel also contains the breakthrough Aqua Micro Capsule (a water capsule which breaks upon application on skin) that release the UV protection agent while giving our skin a cool and refreshed feeling. I am impressed with how Biore's UV Aqua Rich Watery Gel retains its lightweight feel and at the same time provide maximum UV protection. It is even infused with hyaluronic acid and citrus extract to keep skin hydrated and healthy. The Biore UV Aqua Rich Watery Gel is suitable for application on face and body. Retailing at SGD 18.90 for a 90ml bottle, thye Biore Aqua Rich Watery Gel is available at all leading pharmacies, super & hyper markets, departmental stores, beauty stores and selected minimarts. Do your skin a favour now by buying and using this product today!